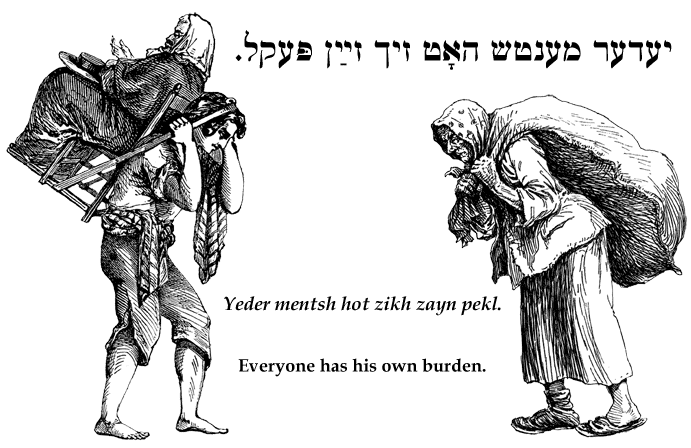 Yiddish Proverb: Everyone has his own burden. יעדער מענטש האָט זיך זײַן פּעקל. Yeder mentsh hot zikh zayn pekl. Everyone has his own burden. Every new day brings its own worries. Der yam iz on a grunt un yidishe tsores on a breg. The ocean has no bottom and Jewish troubles have no limit. If God gives us shoulders, we have to carry the load. Ven ale zoln brengen zeyere peklekh tsores in mark farkoyfn, volt yederer gikh zayn pekl tsurikgekhapt. each person would quickly take back his own.